The Family Institute of Virginia (FIV) is a private clinic located in Richmond, VA. Dr. Friedel is the Medical Director. For patients from the greater Richmond area, as well as those who are within driving distance, the services offered at the FIV include: Diagnostic Evaluation of the patient (including interviews with the patient’s family members); Medication Management; Individual Borderline-Specific Psychotherapy; and Family Counseling. The FIV accepts a limited number of insurance plans. For additional information and to schedule an appointment, please call Dr. Friedel at 804-744-5261. 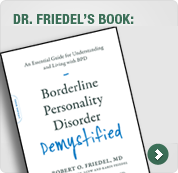 Note: Patients who are not within convenient driving distance of Richmond, and those who come to the FIV clinic from out-of-state, are provided with recommendations regarding sources of BPD-specific psychotherapy in their community.